Tim Keller is the founding pastor of Redeemer Presbyterian Church in Manhattan. The church began in 1989, has 6000 regular attendees, and has spawned more than a dozen daughter churches. See www.redeemer.com. Tim's book is a well reasoned apologetic that grants dignity and respect to all people, regardless of their theological, cultural, political and personal perspectives. 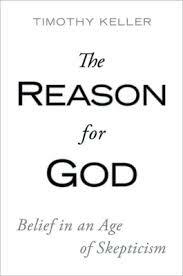 The first part of the book examines seven major objections to faith. The second part describes evidence for God and Christianity. This is an excellent book to give to thoughtful skeptics. 3. Christianity is a straitjacket. "In our culture, divine judgment is one of Christianity's most offensive doctrines." (69) There are a number of hidden beliefs inside this critique. It is one thing to say that I will look for my car keys under the streetlamp because the light is better there. It is another thing to say that the car keys cannot be elsewhere because I can't see there! There are no incontrovertible proofs for God. But when we looked at them as clues, "cumulatively, the clues of God had a lot of force to them." The Big Bang is a clue. That the cosmos is fine-tuned for life is a clue. The regularity of nature is a clue. Beauty is a clue. Keller demonstrates that deep within us we already know there is God. If there is no creator God then there is no sound rationale for moral obligation or human rights. Who says so? In fact, nature itself is terribly violent. "If a premise ('There is no God') leads to a conclusion you know isn't true ('Napalming babies is culturally relative') then why not change the premise?" "…sin destroys us personally. Identity apart from God is inherently unstable. Without God, our sense of worth may seem solid on the surface, but it never is--it can desert you in a moment." (164) "There is no way to avoid this insecurity outside of God." "An identity not based on God also leads inevitably to deep forms of addiction." "Why would Jesus have to die?" is a very frequent question. (187) If someone damages you, you can get revenge--which goes on and on--or you can forgive. But someone pays for the damage. To forgive is a form of suffering. You have both the damage and you forgo revenge. It hurts. Someone pays. "Forgiveness means bearing the cost instead of making the wrongdoer do it, so you can reach out in love to seek your enemy's renewal and change. Forgiveness means absorbing the debt of the sin yourself. Everyone who forgives great evil goes through a death into resurrection, and experiences nails, blood, sweat, and tears." "Everyone who forgives someone bears the other's sins."